It turns out that the Danica Patrick-Milka Duno fight was just the undercard on this weekend’s Ohio brawl calendar. West Ham United visited the Columbus Crew in what can be billed as a classic unfriendly friendly. 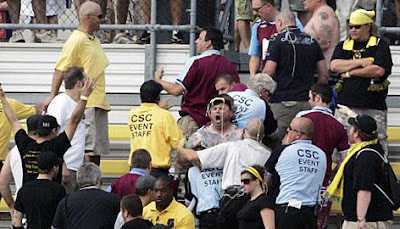 During halftime of the match, West Ham & Columbus fans fought in the stands after several West Ham supporters entered a section packed with the most diehard Crew fans. So far no video has surfaced, but according to police, 100 Crew fans battled 30 United fans. Knowing West Ham fans, the Crew fans should have ran away as fast as they could when they faced those numbers, but they stayed and defended their turf. Yes, the large, shirtless, tattooed gentleman looks just like the tea and crumpets type, if by tea you mean beating the crap out of people and by crumpets you mean beating the crap out of them again. Security and police eventually separated the two groups, but not before several arrests were made and pepper spray was used. A police helicopter was also called in. What this would have accomplished is unclear, but it probably looked cool and provided a nice soundtrack overhead as fans fought each other. MLS is going to have to start thinking about separating fans, just like they do in most other soccer leagues around the world. It’s clear that fans are becoming more vocal in their support of their teams, which is great for the league, but with this, they have also caused more trouble. Look no further than the racism incident in Columbus earlier this season as proof of this. It doesn’t matter who was at fault in this case, the two sides clearly should not have been able to mix. With West Ham traveling to Toronto this week for the MLS All-Star Game, the league needs to make sure that a similar incident doesn’t happen in Canada. The last thing they need is to get David Beckham killed in a soccer riot. And West Ham United is clearly about rioting. On the list of unwanted gifts from Europe, this ranks somewhere between Ace of Base and smallpox.